Officials at collegiate sporting venues have been leading efforts toward zero-waste events with many professional and collegiate leagues adopting energy and water conservation efforts as well as increased recycling and composting. 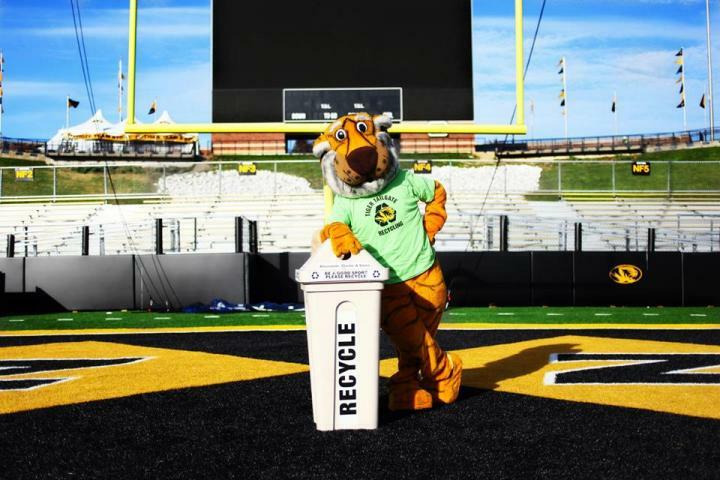 Researchers at the University of Missouri recently published a study analyzing waste and recyclables during Mizzou's 2014 home football season. By implementing several recommendations the team developed, such as offering better recycling receptacles and better sorting options for waste, sporting venues could be well on their way to achieving environmental benefits that exceed the standards for 'zero-waste' operations. "Zero waste means designing and managing products and processes to systematically avoid and eliminate the volume and toxicity of waste and materials with the target of recycling or composting at least 90 percent of the waste generated at football games," said Christine Costello, assistant research professor of bioengineering in the MU College of Engineering. "Our objectives were to develop a system to characterize the waste produced at sporting events prior to game day and unsold food disposed of on game day, quantify the greenhouse gases produced, identify waste management and recycling strategies, and develop scenarios that event managers can use to decrease life cycle greenhouse gas emissions and energy use." The research team audited the landfill-destined waste generated at Mizzou's Memorial Stadium at five home football games game in 2014. Team members counted garbage bags disposed of during and after the games and sorted representative sample bags, which were inventoried to identify the contents. An estimated 47.3 metric tons (mt) of waste was generated. The majority of the waste, or 29.6 mt of food, was prepared off-site where a full 96 percent was unsold food waste. The remaining 17.7 metric tons of waste originated inside the stadium, with recyclable materials accounting for 43 percent, followed by food waste at 24 percent with most of the remaining waste destined for the landfill. "Athletic events offer a great opportunity for engaging with a large, diverse crowd that may or may not be familiar with sustainability issues," said Ronald G. McGarvey, who holds a dual appointment as an assistant professor of industrial and manufacturing systems engineering in the MU College of Engineering and an assistant professor of public affairs in the Truman School of Public Affairs. "Sporting event organizers can generate pro-environmental messaging to a broad audience and should take advantage of getting the word out about sustainable operations. This would be a wonderful public relations tool for these professional and collegiate leagues and should be pursued." Costello notes that the MU Office of Sustainability has a Gold Rating from the Sustainability Tracking, Assessment and Rating System through the Association for the Advancement of Sustainability in Higher Education. Its mission is to be the focal point and catalyst for sustainability related operations, education, research and planning on a campus that implements the Missouri Method by serving as a living laboratory for sustainability. Also, several teams in the Southeastern Conference (SEC) are working toward zero-waste events, including the University of Florida. The study, "Achieving Sustainability beyond Zero Waste: A Case Study from a College Football Stadium," recently was published in Sustainability. Funding was provided by The Mizzou Advantage, an initiative that fosters interdisciplinary collaboration among faculty, staff, students and external partners to solve real-world problems in four areas of strength identified at the University of Missouri, including Food for the Future, One Health/One Medicine, Sustainable Energy and Media of the Future. The authors wish to thank Anthony Wirkus and the University of Missouri's Intercollegiate Athletics Department for their interest and cooperation throughout the study.